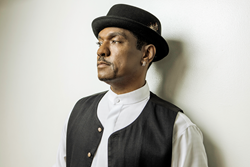 Home Entertainment News Music News Nexxlegacy Radio News Ronn David - the son of Rock and Roll Hall of Fame legends Ruth Brown and Clyde McPhatter, releases new hit single "I Want Your Lovin'." Ronn David - the son of Rock and Roll Hall of Fame legends Ruth Brown and Clyde McPhatter, releases new hit single "I Want Your Lovin'." Ronn David, the son of Rock and Roll Hall of Fame legends Ruth Brown and Clyde McPhatter, releases new hit single "I Want Your Lovin'." succeed on my own merits." Ronn David knows more than anyone that he has a lot to live up to. The son of Ruth Brown, the Queen of Rhythm and Blues, and Clyde McPhatter, the founder and lead vocalist of The Drifters, David knows what it takes to make it in the music business... and it all begins with a great song. "I Want Your Lovin'," Ronn's new single from his upcoming album, is that song. Guaranteed to shake away the winter blues, "I Want Your Lovin'" is perfect for springtime, impossibly catchy, smoothly soulful, and with a ready-made dance poised to fill the floor at clubs and parties from coast-to-coast, "I Want Your Lovin'" just may give Ronn David something he richly deserves: the opportunity to shine as brightly as his Rock and Roll Hall of Fame parents stars. "I love and respect what my parents accomplished very much; but like most folks, I want to make my own mark on the world. And for me, a big part of that is to make my music and succeed on my own merits," says Ronn with an easy smile from his Los Angeles home, a stone's throw away from Hollywood Boulevard and the Capitol Records studio where his folks recorded some of their biggest hits.Turns out Ronn is far too modest about what he's already accomplished on his own. David is already a triple-threat veteran of music: he's toured with artists as varied as Bonnie Raitt and Rick James, performed three times at The White House, and often pays tribute to his famous dad in concert by performing Drifters classics like "On Broadway" and "Under The Boardwalk" with his own contemporary twist. He's been in movies: that's Ronn clearly enjoying singing side by side, then eye-to-eye with Halle Berry in "Why Do Fools Fall In Love" and appearing in other great music-in-movies films about The Temptations, Little Richard and The Five Heartbeats. And finally, in television: a young Ronn worked with the legendary comic Redd Foxx on his final TV show. Now, Ronn is now poised to take his silky vocal stylings to radio stations, on-line portals and dance clubs across the USA. So when you hear "I Want Your Lovin'" blasting out of a passing car radio, on a co-workers computer, or pumping out of a hot club DJ's Saturday night dance set, you're hearing more than a great song; you're hearing the legacy of two American musical treasures come into his own. You're hearing Ronn David's "I Want Your Lovin'." And, with or without the backstory, it sounds damn good.